Discussion: Opposite ends of the tech spectrum: advanced technology in Mike S' new phone scares him, and Mike M is still lugging around ancient technology with him. Both of them reminisce over ancient computing technologies and fond tech memories. Help us help Mike M let go of his old stuff. Interview: We chat with F. Paul Wilson, author of over 40 novels including the seminal Repairman Jack and Adversary Cycle series, about his newest book, a young adult entry about Jack's teen years, Jack: Secret Histories. He gives us a history on building Jack up by going back to his teen years in the Pine Barrens when he's slowly discovering his abilities as well as defining his loyalties to his friends. Paul also tells us stories about the mystique of the Pine Barrens, the Jersey Devil, and the supernatural unknowns that might still be lurking deep in the lands untouched by humans. 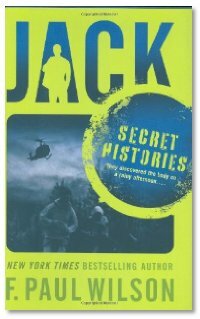 If you've never experienced a Repairman Jack novel, you don't know what sort of fun you're missing, and Jack: Secret Histories is a good place to start.